Hard to see the water but, trust me, it's in there. Microwave on high for about 8 minutes (on mine) and test for squishability. Microwave longer if needed. Now here's the really important part. Leave the potato sitting there for about five minutes to steam. I've found that almost all of the water will be absorbed and leaves the skin nice and moist. Voila. Split and dress as usual. great tip. i have one concern re: this method. while researching microwave safety, we learnt that plastic bags, cling wrap, etc. should not touch the food. a m/w safe container with a lid may work better from the food safety standpoint. Thanks, Glenna, you are a sweetheart to post this. Tom--You're so welcome. I'm the same way. I've heard all that too and I figure at this point I'm already screwed. And yeah, I remember the cell phone one too! I like this tip, Glenna, thanks. Will definitely try it. Cynthia--you're welcome. It really is a great way to "bake" potatoes especially in the summer when heating up the oven for an hour or more is bad deal. Tara--Thanks so much for telling me about you liked the "recipe" and the nice compliment. You made my day! Ohh, that looks so tasty! I am sure that it will be perfect for my picky eater diet! Thank you for the wonderful recipe! I will try it! have not tried this method but will. It will be a great help to get dinner ready F. A. S. T.
Thanks for the recipe Glenna, will give it a try tonight! It's making my mouth water just looking at that. 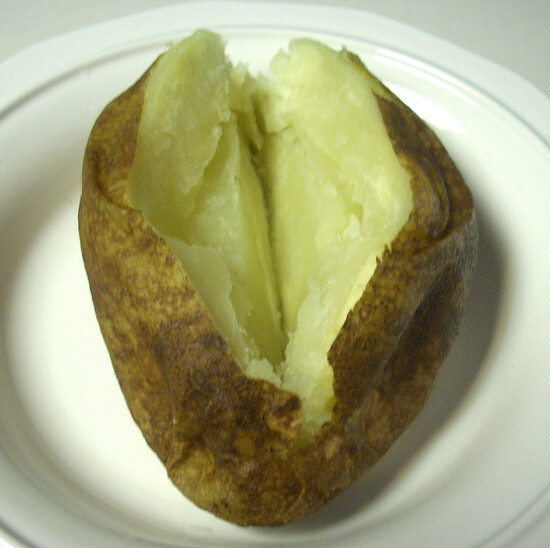 I love Jacket Potato's! This was such a wonderful post! Thanks so much. I have a meal plan service and will use this idea for quick lunches. I'll link back to your site of course. Quick question: Prior to cooking, do you still pierce the potato with a fork or is it not necessary due to the steamed water in the bag? Jean--in my experience it doesn't matter. I've poked and not poked with a fork and they've always come out the same and have never done anything funky during cooking either way. 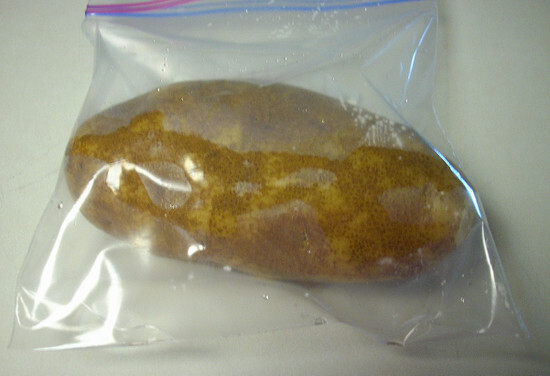 How long would you cook 2 or 3 potatoes together, or would you need to do them one at a time? Sonya, I'd start at about 12-15 minutes and then just squeeze to see when they're soft enough. Laurie--that's a great idea too!